Last Table post for the year. All that's left to do now is celebrate the old and welcome in the new. And, in case you don't get a chance to sing Auld Lang Syne, you can karaoke it here...words, meanings, and karaoke all in one convenient stop. Come on, go sing along...it's tradition! Meet you back here in 2008. Auld acquaintances are never forgotten: Happiest and Most Blessed of New Years to All of You From All of Us! If space aliens landed in Carmel at 5:00 a.m. and began searching for signs of human life, they would be hard pressed to find anything short of...or wait, they may just have stumbled upon the hottest ticket in town as they follow the steady stream of cars and SUVs all headed in one direction...yes, indeed, here is life as the humans must know it! Life that said aliens have been searching for, specimens to study, knowledge to take back to Planet X..."Quick," they must think, "get in line, act as if you might fit in by following the line...let's see where it leads and what we will discover." Cars lining up, disgorging one or two human specimens (I think they are human, some of them look a little zombie-like) shuffling toward the doors...let's see where it leads: Ah, to water...this must be how all the humans get water each day. Or so one would think, being an alien and all. Kidding aside, the line to the CHS pool on weekday mornings is the only sign of life around here at 5:00 a.m., and judging from the hundred or so cars winding through the driveways, parking lots, and lining up to the door, truly the hottest ticket in town. 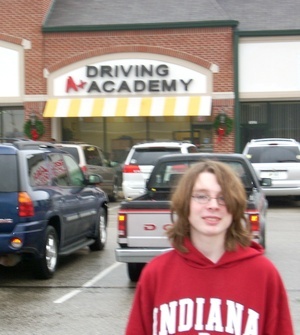 We must wear IU apparel on IU game days...sometimes it even matches! Mark and Matt backing up to check the status of things in the height contest...Mark still has him by an inch or so...am thinking that isn't going to last much longer...what do you think? Best night last night: a double header on the BTN, both wins. Okay...not that pretty with the Hawks, but the Hoos looked fine. Almost a full complement of players for the Hoos, AJ still having a sprained ankle and all, so we have yet to have all our team on the bench ready to play in any one game...soon, hopefully by next Wednesday when the Hoos and the Hawks play each other in IC. Hoos have to start the first several games off on the road...hmmm...we will have to see how that goes, won't we? For the Hawks: Tony Freeman was suited up and playing, so that was fun to see (since we watched his dad, Tony Freeman, Sr., play those years at IU) and believe me, those baby Hawks need Freeman suited up and playing. What's up today over here? Don't ask...really, don't ask: the Men's Den is about to be expanded into the Men's Den II...and I believe they are thinking this long holiday span is THE TIME, rather than waiting until I am off and out of here at the end of January for my yearly retreat. The target? The old school room...no longer in use as a school room this year...therefore, "Mom, please, it's just wasted space now...we could have a whole room just for our own and have all the game systems in there...it would be so COOL!" And, so it all goes...our wonderful school room with the huge chalkboard, bulletin boards, President photos marching around the ceiling border, the rolltop desks, computer stations, shelves and shelves of school books, and all those years of learning together and watching two little boys grow into young gentlemen. I'm a little wistful, but one can't hang on forever...I do know that...so, it's time to move on: Men's Den II is about to come into existence. There were so many hellos and goodbyes this year...I am reeling with the speed and feeling of powerlessness, thinking the upcoming new year is going to be on more of an even keel for me with fewer changes in store. (I am never all that shot up about a lot of changes.) How about you...what kind of a year was it for you and what do you think the New Year will bring? READING: New camera instruction book...This camera can do everything: Bake bread, clean the house, do the laundry, run errands...okay, maybe not, but it can do a whole lot of other fun stuff! I couldn't think of any "N" names that seem to fit, so in honor of Didgy, I have decided to go with a "D" name, this one is definitely a girl and Dixie seemed to fit as Nikon D40x has a "D" and an "x". It's cute...going for cute these days. As a joke, Mark said, "Great, I can take this to New York with me on the choir trip!" I just smiled and said, "Sorry, pal, not happening...." I knew he was kidding. (For those who don't know, Mark LOST Didgy in Rome on the first day of the Italy choir trip this summer, so he has sort of been suspended in camera privileges for any further use of my favorite camera. Or at least that's the plan for now. However, he is rather cute and nice, so camera privileges could be reinstated with a simple request should he really desire them.) I guess I can toss Didgy's manual now as I figure he is not coming back. Hope whoever has him is being good to him. It's hard to lose a friend. POOLSIDE READING: Carolyn Hart's mysteries. LISTENING TO: Classical; some Christmas yet; Frank Sinatra; JCM (inducted into the Rock and Roll Hall of Fame recently...and he's an Indiana boy); Matchbox Twenty...just floating about listening to whatever comes to mind. COOKING THROUGH: Susan and Al gave me Alice Waters' new cookbook The Art of Simple Food for Christmas...it is part instruction book, part cookbook, part history, part Green...well, lots of "parts" and I am starting on page 1 and going to work my way through the entire book...right now I am reading about the benefits of being in a CSA, which I already know as I have done that...more on that another time. FAV NEW FIND: My fancy new camera...yes, indeed, a very fine camera...thank you, Cindy, for helping pick it out, Mark was very grateful that he didn't have to do it alone...you were right: I love, love, love it! FAV THING TODAY: Getting "late" Christmas cards, letters, photos in the mail...it makes Christmas last longer and cushions the disappointment, after going to the mailbox each day in December and finding actual fun mail there, of realizing that the influx of fun snail mail is coming to a halt. That's what I LOVE about email: you know there is always going to be a fun greeting there every day! GOING TO: Museums every day these next two weeks...just try to stop me: I have hardly any volunteer work, the kids and husband are home and willing to accompany me, and I intend on making these two weeks a vacation! Come on and go with us...we will meet you there...it will be FUN, really...come on...what else are you going to be doing? PRAYING FOR: Safe travel and much success for Suzanne Hayes Drayer and her team going to Haiti from today until January 5th on a mission performing eye and dental care/work, please join me. Merry Christmas to All around the Table...even though we can't be there in person, we are there in thought. Hugs, Kisses, and Best Wishes from all of us to all of you. Merry Christmas! 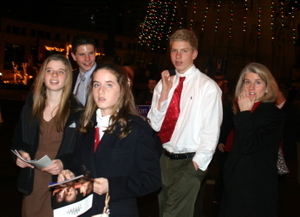 Downtown on The Circle last night: Allie (Brooke's friend), Matt, Brooke (Daniel's sister), Daniel, Kathy (Daniel's mother). 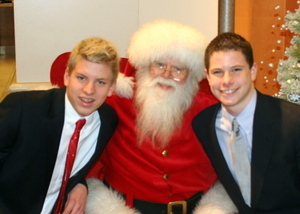 And, the second photo is Daniel and Matt with a familiar figure...15 and still sitting on Santa's lap...how cool is that?! I know I have been woefully lacking in the posting department here at the Table lately, but I want you to know that I am DONE, DONE, DONE with the Christmas prep around here, so I have not been just frittering my time away these past days. (Okay, there was a certain amount of frittering, I will admit it.) 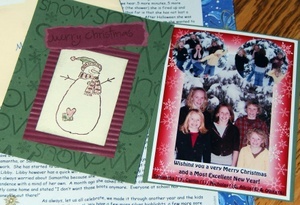 I just finished the last Christmas card/letter (much later than usual, but some years are just like that, right? 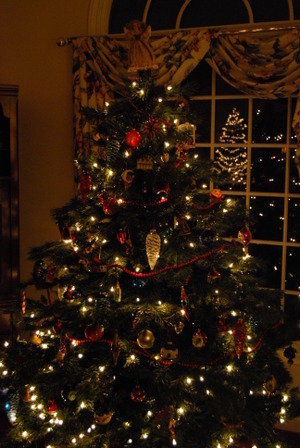 ), all the gifts are wrapped, tagged, and waiting under the trees, all the grocery shopping is completed, the house is looking very spiffy, and I can't think that there is anything left to do except light the candles and cook the meal tomorrow when Mark's family arrives. Just for fun, I visit this little site during the winter months to remind myself why I like living in Indiana so much...this morning, for instance, the roads up in my hometown area were completely covered with snow and CLOSED. Another reason that sign on the I80 bridge crossing the Mississippi saying "Welcome to Iowa" should have a little * with a footnote saying, "Closed for Winter...See You in the Spring." The snow here is gone...all melted away yesterday in that 52 degree weather we were having..."were having." Tonight it is windy and cold with more of this expected tomorrow. And now I am going to enjoy the rest of the evening with my book curled up in my jammies and under one of Grandma Sieckmann's quilts beside the lovely fire...what's going on over there? Cheryl & Co. 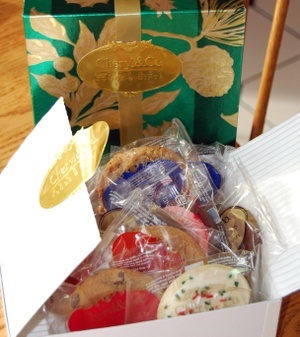 Cookies...Downright Sinful! READING: A mishmash of things as I am catching up on bits and pieces so I can start the new year fresh. COOKING THROUGH: Not much...we are so busy with swimming and choir that it has been old standbys only...nothing new going on at all. Next week. FAV THING TODAY: Getting Christmas cards, photos, and letters in the mail. Absolutely my favorite time of year for mail! PRAYING FOR: A speedy recovery for Mark's Dad, Emil, who had surgery yesterday; for safe travel for the holidays for everyone; for families who have had to part with loved ones this year and are in mourning their first Christmas without them; and for friends and family near and far...please join me. And, because she requested it on the blog comments in the previous entry, here is the wooden apple ornament that represents Shelley...the Teacher who shares her immense knowledge of all things Shakespeare and HISTO with the ICHSA group to the delight of all the parents and students...and she does this with no charge for her services, vast as they are and worth more than any of us could ever pay her. It's a true teacher at heart who gives so generously and expects nothing in return. 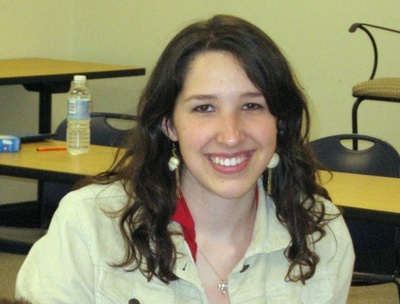 That describes every aspect of Shelley's personality in all my years of knowing her. To those of you who I sent photos of ornaments to individually (because you didn't ask in the blog comments so I figured you wanted to keep it private), this has been a lot of fun...I had no idea this would be such fun to share all these with you...and even more fun reading your comments to me about them. Thanks for playing! 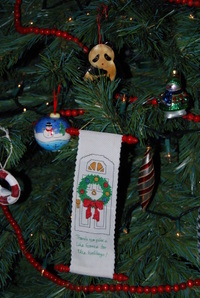 And, because Karen asked for it on the comment section of the previous blog...here it is: the little scroll ornament that she made, oh about half a lifetime ago...it has held up remarkably well and I still love it as much today (probably more) than the day she gave it to me. You can click on the photo to enlarge; it says, "There is no place like home for the holidays." I love that she made it herself as she is sort of crafty that way. Today is the day: NEED to get the Christmas cards/letters finished TODAY (maybe if I actually write it and commit to it, those last few will be finally finished and in the mail by tomorrow morning...that is the hope anyway). Also, NEED to get some Christmas baking done as I have been woefully negligent in that area...and have not a clue yet what the menu will be when Mark's family all shows up on Christmas Eve...suggestions welcome as there is no set tradition...I make something different for it each year. The only thing for certain each year is my Wassail...that would be a traditional expectation on Christmas Eve here. Suggestions, anyone? Go out today and make something good happen for someone else for no reason whatsoever. Tis the Season and all. The tree in the front living room with the mishmash of ornaments that have been collected over the years by way of gifts, vacation souvenirs, childhood ornaments, etc. There is something on this tree that represents pretty much every important person in our lives since childhood. Want to know what is on there that represents YOU? Email me and I will let you know. And, yes, you are on there. Really, you are! Through the front window you can see the tree out front that is all lit up (also the reflected lights on the window, of course). 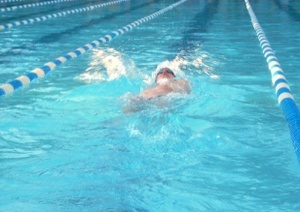 Two hour delay for schools today, so that meant a two hour delay for swim team practice also...I think I could really get into a schedule that went like this: Swim team: 7:15-9:15; School 9:40 to 3:30...I am thinking the kids (and especially swim parents) would be much better rested on a schedule something like that...okay, I know...but dreams are important, too, right? Mark and the boys loaded up the snowblower yesterday and drove up to Elwood to dig out his parents and stock their pantry and refrigerator for them. We have mixed feelings about this (not about the pantry and frig as it is important to keep them fed and watered, of course), but the actual making-it-possible-for-them-to-get-out deal. They are in their 80's and we aren't sure we really want them out and about on these snowy and icy streets. However, since they live about 45 minutes away, it would be difficult for us to get up there at a moment's notice should one of them need to go to the ER or something along those lines. So, we dug them out. And, we are keeping our fingers crossed that the need for Christmas shopping, etc. can wait until the weekend when Nan comes home for the holidays, and everything else can wait until Luke gets there tomorrow. That's the plan anyway. Sometimes things don't go according to the plan, so that's why we are keeping our fingers crossed. Mark arrived home this evening, chipper as always (that's the great thing about being married to a trial lawyer as anytime they are out of the courtroom or office is like a vacation...Mark is always in a good mood when he arrives home), asking, "Did a box arrive yet from LL Bean?" Me: "Clueless...just got home, you will need to check the front stoop." Mark: "Yes, indeed, package has arrived." Me: "Great...what's in it?" Mark, big smile: "Oh, you bought a shirt for Dad for Christmas." Me: "How very thoughtful and swell of me." Mark: "Yep, and while you were ordering that you stumbled upon a few things for Christmas for me, too." Me: "Ah, did I now?" Mark: "Indeed you did. And, look, just the right size and colors...exactly what I would have chosen." Me: "Well, I am so very good at this sort of thing. Isn't it a good thing that you married me?" Mark: "Ah, all these wondrous perks." And, that, ladies and gentlemen is why I am so happy that I married this man (well, one of the many reasons): He doesn't expect me to shop and I don't expect him to cook or do laundry: It's a Wonderful Life. 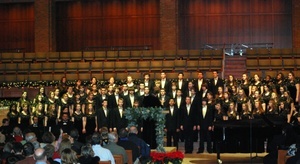 We are in the final countdown with the Christmas Concert singing gigs...one IYC one on Monday night yet and then the Guerin Choir one on Wednesday night. 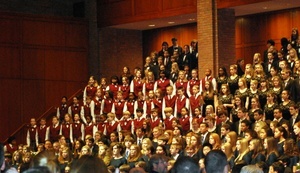 Whew...the kids have been taping, recording, and singing this week since Wednesday, with two performances yesterday. Here are a few photos. 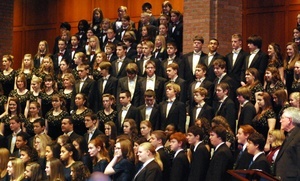 This concert is huge, and yet it was only the top four choirs last night...yesterday afternoon being all the lower choirs plus Matt's IYC choir (the big guns so the little kids/families can see where they are headed). Last night there was one huge, everyone-excitingly-leaping-to-their-feet-at-the-conclusion-of-it, ovation, and that was Matt's choir on "Oh Holy Night"...it was fantastic. Really outstanding, and believe me, this audience is spoiled with the ICC and they know outstanding. It was just beautiful. After the performance, I turned to Mark and said, "What's the game plan?" He replied, "Well, I guess same as every year, we try to locate Matt or Ali, hook up with Buddy and Lauri (Ali's parents), and figure sooner or later we will have seen almost everyone here...probably over a thousand people." And he was not kidding. We always just sort of work our way to the middle and stand there, as at this stage of the game, we have learned that Matt and Ali are very popular with the kids and adults and it will be at least an hour before they are finished greeting and hugging and chatting with everyone there. Mark has his own following, of course, having a great degree of popularity with the kids and parents as he has chaperoned countless concerts and three overseas tours...I was looking forward to seeing past graduates, kids that didn't get to move to IYC this year but will next, parents, choir directors, etc....Buddy and Laurie have their own following, Laurie being a big hugger of anything that moves as she is so sweet, and Buddy, well you just have to know Buddy to know that where Buddy goes, there is a party. All in all, trying to get Ali and Matt out the door before there was anything but a handful of people left was like, as the saying goes, trying to nail Jello to a wall. They were here, they were there, they were everywhere having the greatest time. And so did we...and I don't say that lightly as all these Christmas festivities and frivolity are cutting into my BTN time court side, so we had to ti-vo the IU game this evening while we were out. The nice thing about the Christmas season is that one could have date night each night of the week with all the festivities going on...and it is always nice to be out and about with my better half. Snow? Did we get snow? Don't ask...everything is pretty much at a standstill here this morning with five inches of snow and the wind blowing it all about here and there. Cold, windy, snowy, icy, slick...only necessary trips out today...there is a comfy chair, a good book, some Christmas baking, and a warm fire going on around here...what's up over there? The family room tree last evening...the crazy tree that cats climb, dogs steal candy canes from, the calico angel never sits atop properly, is filled with mostly the inexpensive plain colored glass balls and silver tinsel of my childhood, is nothing fancy, and is just lots of sparkle and fun. Around here today: "Honey, did you bring home the list of people you wanted to send Christmas cards to this year, business-wise, etc.?" (Each year Mark brings home a list, but it is actually myself who addresses and sends them out, a job I don't mind doing at all, but rather like to take care of it in a timely manner, if you get my drift...i.e. 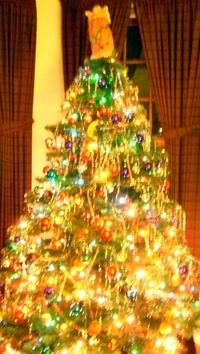 before Christmas week.) His reply, "Oh, no, I keep forgetting to do that. You know what, why I don't I take care of that for you this year?" Hmmmm...knowing Mark as I do in matters such as these, I countered laughingly with, "Okay, I wasn't born yesterday, so I am pretty certain this means that these cards are not going out this year, am I close?" He just chuckled and said, "Well, I never actually said they would be going out, I just indicated I would take care of it for you." With men, being able to read between the lines is key. Always, however, I am amused by the wiles. And yes, the cards will go out, no matter when he gets the addresses to me. It's one of those things that scores me extra points around here. Extra points are always good. Me: "Do you have a hard driver for the outside?" Clerk: "Do you mean an external drive?" Me: "Yes, I suppose I do." Clerk: "What size would you like?" Me: "They come in different sizes?" Clerk: "Yes, how many gigabytes do you want?" Me: "You know what, maybe my husband should come in and take care of this." Clerk: "That might be best." I could see the writing on the wall...another Blu-ray incident in the making. Best to quit while it still feels like you have some dignity. After all, when you find a good thing, sharing it is a lovely thing to do...so I am sharing this today. When I first stumbled upon blogging, in order to understand it, I would follow links on other blogs to educate myself as to what this blogging world was all about. The first blog I stumbled upon had some fun links and I bookmarked two that I liked from her blog and am including them on my side panel under the Etsy category. 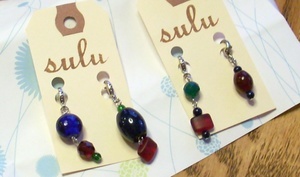 Susan at sulu designs beaded earrings. I fell in love with her sparkly glass beads, the dark mysterious wooden ones, and even some of the funky ones. I don't shop much, but there was a little part of me that wished I had pierced ears so that I could own a pair of sulu earrings. And, then, lo...I found a fun solution! Frankie's (my day planner) zipper has always been a bit of a pain as it sticks a little in the fabric of the zipper...now, however, I have a solution and a sulu design...I asked Susan if she would make a zipper pull for me in the style of her earrings and she was delighted to do so...she made four of them in my favorite colors: navy, cranberry, and hunter green. I just got them today...have a look and then click on her website and check out her earring selection! (And, if you want your own sparkly zipper pull, you can special order it from her.) My old workhorse of a day planner now has a little sparkly smile to it...and the other three pulls are in active use on my camera, another purse, and today on my sweater. Thanks, Susan...they turned out great...and now, I have another idea and I will send it to your email! And everyone else, it's not too late to Christmas shop...check out sulu designs and shipping is free! 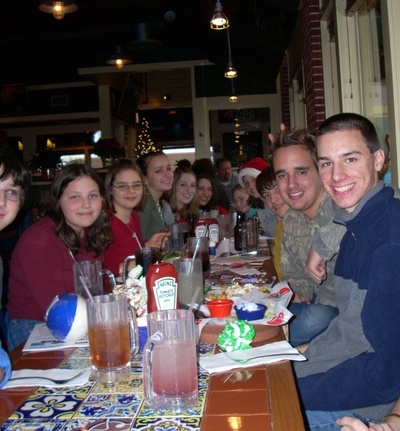 Some of the cute faces of FACES...from the left: Alex B., Sarah, Alyssa, Mary, Sammie, Kate, Jenny, Lora, Nicky, Luke, and Weston at Chili's enjoying Christmas lunch and gift exchange. READING: Catherine the Great by Virginia Rounding...still working on it as it is 506 pages of pure reading pleasure and that doesn't even take into consideration the end papers! COOKING THROUGH: Nothing really special...Seared tilapia with tomato basil sauce and Farfalle with Peas, Pignoli, and Shaved Parmigiano Reggiano for supper...come on over if it sounds good to you, I can set an extra plate or two and I'd love to see you! FAV THING TODAY: Christmas lunch with the FACES group...well, at least the ones that could make it today! It was so great to see everyone, laugh, and just be together. FUNNY BIT I AM STILL CHUCKLING OVER: Yesterday I asked Matt what he had for lunch and he said, "Chicken Caesar Salad," to which I replied, "I thought they were having lasagna," as I know he loves Italian food. "Oh, they did, but I had forgotten my notebook in my last class and had to go back to get it, so by the time I got to the lunchroom all the kids were saying, "Don't get the lasagna!" Apparently, the lunch ladies did not realize that the lasagnas were frozen in the middle and were handing them out in that state. By the time the kids figured it out, there was very little time to return it to get it heated, so Matt opted for another choice. I said, "Good call." He replied, "Well, Matt March ate the whole thing frozen and said it wasn't all that bad." OMW...this just goes to prove my point: Teenage boys will eat ANYTHING not nailed down. Can you even imagine eating half frozen lasagna? Still chuckling to myself about it. PRAYING FOR: Hannah Roth, one of the freshman girls at Guerin, who is suffering much with liver cancer and waiting patiently for a liver transplant. Please join me. 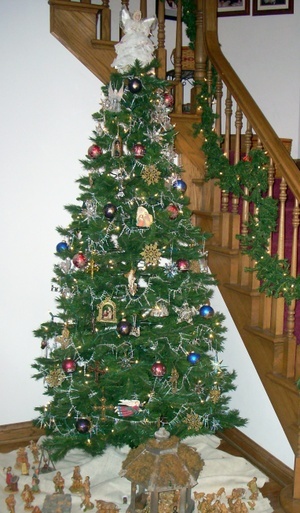 The Christmas tree in the foyer with the Creche beneath it. Through the years the children have all loved to come and play with the Nativity figures, moving them about, etc., and having great fun with them, so we just always keep it under the tree. In the past when Matt and Alex were younger, it was not unusual to see the scene sporting Lego buildings and Hot Wheels cars parked about in Bethlehem. Pippin and Vash occasionally kidnap a figure and hold it hostage for a dog biscuit, but they have never chewed one or damaged it. Sophie likes to bat the icicles about, so the bottom of the tree is usually in a state of dishevelment from her rearranging things slightly...all in all, the tree holds up fairly well throughout the season. I received several emails yesterday asking why I don't like to go to The Mall. Hmmm...can I just say that I don't and leave it at that? I am afraid if I answer, there is a chance that someone will take it personally by thinking that I am making some sort of judgment about them because they do like to go to The Mall. It's not a judgment call...I just don't take any great pleasure in shopping. I would rather be reading and "shopping" for knowledge. I like that you all enjoy it, however. When our boys were little, I would occasionally take them to Target when I needed things like diapers, formula, etc. and they weren't all that enamored of riding in the cart and hearing bits like "Please don't touch those things," so more often than not, I saved those little forays for the evenings when Mark was home to entertain the tots at home. I managed to keep them in the dark about The Mall until they were TEN years old...my goal was much longer, but the gig was up one day when Mark took them over to Galyan's Sporting Goods so that they could climb the rock wall there. I figured this was safe enough...Galyan's having it's own outside access door, etc., and the wall being right inside the door just to the left. Away they went. First thing I heard when they returned? "Mom, MOM, you will not believe what we saw, you have to come and see it! It is called THE MALL and it is so cool! There are all these stores hooked up together with a big roof so you can walk from one to the other and not get wet when it is raining outside, and they have everything you have ever seen, and they have so much food, and you can choose whatever you want, and so can everyone else. Mom, you have to come and see!" Well, I was stunned...blindsided by my own husband. "Hmmm...Honey, how did this happen?" His only defense (weak as it was even at the time): "Well, we were thirsty and hungry after all that climbing, and I thought it probably wouldn't hurt anything to just slip out into The Mall to get something to eat and drink. I had no idea this would happen." And, so the gig was up...you can't keep young boys on the farm when they have seen the bright lights of the city, as they say. At least I did have ten years of complete bliss as far as requests for trips to The Mall...nowadays, not so much...the saving note being that when those requests now come in, all I have to do is turn to Mark and say, "Well, Honey, what do you think...are YOU up for a trip to the Mall with the boys?" He just smiles and says, "If I had known this would happen...." Hindsight...20/20. Pizza Hut Book-It lunch today, a big crowd with lots of smiling, happy children...and some pink for me...well, these girls wore pink and Lucas just wanted to be in a photo on the blog, so he grabbed something pink so that he could pose...so cute! Lucas, btw, is Matt's little buddy...Matt trained Lucas to serve Mass at SEAS and take over for him at the Daily Masses when Matt went to Guerin this year. Lucas is doing a fine job and reminds me of Matt, also beginning serving at such a young age at the Daily Masses...seems like a long time ago already. Anyway, Lucas has taken over Matt's position at Daily Mass at SEAS and he and Matt serve together at Sunday Mass on the weekends. 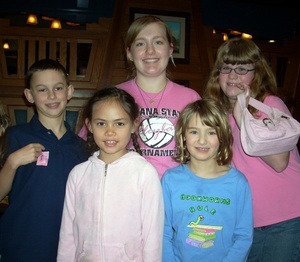 The others in the photo are Maria, Meg, Leah, and Sunny, who thoughtfully selected a pink purse to carry today, just for me as she is always so sweet and thoughtful like that...bringing sunshine wherever she goes. 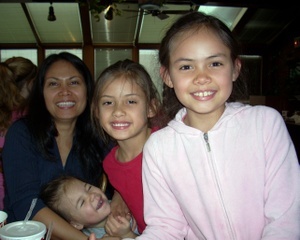 The second photo is for MK...recognize these girls??? I thought you might...Gloria with her girls: Rachel (being very silly and not wanting to pose for the camera), Rebecca, and Maria...all say "hello" from Indiana. We all had a chance to catch up with newsy bits, discuss curriculum and glitches in curriculum planning, relay to one another service projects and volunteer opportunities, encourage all the children in their various endeavors, and have some laughter and fun...a great way to spend a few hours on a cold and rainy day. Afterwards I went to the mall. You heard me. The Mall. Gasp. Pick yourselves up, dust yourselves off a bit, and know that this is traditionally the season of miracles. There comes a point in the Christmas frivolity when a trip to The Mall become absolutely necessary. This is was one of those times. I called Mark at the office and said, "I am going to The Mall." His response? "WHAT????" "Yes, indeed, I am armed for combat...I have nice sturdy shoes, strategic plans (I figure if I go at 2:30, a lot of people will be home with napping infants/toddlers and/or waiting for the school buses to return their children home, and it would be too early for the school crowd or the 9-5ers, who would still be at school and work respectively), and I have a good attitude about it all...hopefully in and out in less than 15 minutes." And, I was...14 minutes, got exactly what I needed, had no line to wait in, and get this: I had a parking space three in from the door I needed to enter...miracles happen. It went great. I may have to shop more often. Yeah, right...the trick is to quit when you are ahead. Sometimes it is difficult to know when you are ahead, but this, I am thinking, is the time to revel in success and call it a day. Me at The Mall...who knew? 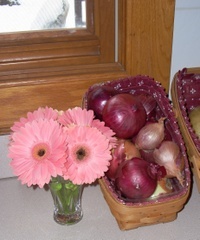 Enough of the snow photos...my favorite little Gerber Daisies gracing the kitchen counter this week. I smile each time I see them. They just look so happy...and they last an amazing amount of time, coming in a lovely variety of colors...and best of all: they are not at all expensive. The first flowers I ever received (well, flowers that were not corsages for dances that is) were daisies, and daisies to this day, are among my very favorites...aren't these pretty? And PINK! It's been a perfect weekend so far...and very productive! Date night always starts things off nicely, tidying bits around the house this morning, lunch out with Mark and Matt at Kona Grill at noon (my favorite Oriental Salad with Macadamia Nut Chicken), followed by an extremely productive Christmas shopping melee (abounding craziness during the Christmas shopping season...yikes, but you would all be very proud of me as I stuck with it, joyfully, and with patience I have heretofore never shown in the shopping realm...maybe I am mellowing a bit), and winding up in time to park myself in front of the television for the IU/Kentucky game. Christmas parties that begin at 6:00 p.m. on a scheduled game day have surely no real expectations that people will arrive promptly, right? Or so I am hoping because I doubt Blue Bernice will be on her way anywhere until the final buzzer. Hope you are all having a great weekend! All I can say is that this is totally my doing...each year I always think that summer/fall is going to last just one more week, just one more little week, and I talk Mark into leaving the deck furniture out for me so that I can sit and read or gaze at the moon in the evening while I say my nightly prayers...it is just so hard to say, "Okay, I guess you can pack it all away now," each year. Oops...might have waited a little long this year. 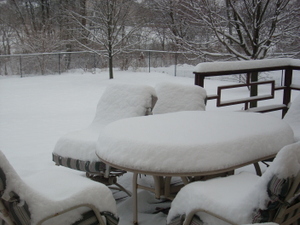 We got a tad more snow last night...about four inches. As I said, no looking back...I think we are in this winter thing for the long haul. It is rather sparkly and pretty today. 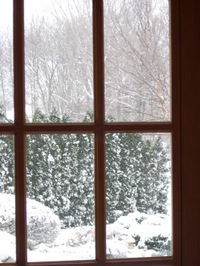 Looking out the kitchen nook door as the snow was falling...we are due for another four inches this evening, or so I hear tell. READING: Catherine the Great by Virginia Rounding...obviously a new non-fiction book about Catherine the Great. Nothing new and shattering so far...believe me, I would know as I have read a lot about Catherine the Great over the years. 506 pages of pure reading pleasure and that doesn't even take into consideration the end papers! LISTENING TO: Bing Crosby Christmas CD...corny, I know, but I just love his voice, and I am addressing the Christmas card envelopes, so it fits the mood...and what's Christmas without Bing anyway? COOKING THROUGH: Standbys...per requests around here this past week. Holiday baking over the weekend hopefully. Oh, and I did make gravy for the priests' roast this week...with great success apparently because they said they really liked it and Father Rothrock said it reminded him fondly of his mother's gravy of days past...who knew...I don't make gravy as no one here likes it, so I wasn't even sure I could do it. Apparently I can, so now I have that going for me in case that should ever be a defining recommendation for anything in the future. I won't hold my breath. FAV NEW FIND: Replacement strand for the crystal icicle garland on the Advent Christmas tree...the other one was shattered two years ago and the ones I had remaining weren't enough to do the tree as I like it done, so this was a great find! FAV THING TODAY: Smiles from those around me. Smiles go a long way to making a day great always. GOING TO: Make every effort to get our family Christmas cards and photo in the mail by the end of the weekend. 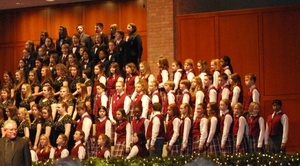 PRAYING FOR: The in-need families we are providing for over the holidays through church, school, swim team, and choir. All families in-need this Christmas, especially the children. Please join me. 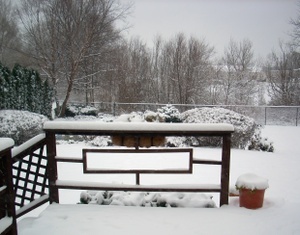 As you can see from the view off the deck this morning, winter is upon us...no looking back. 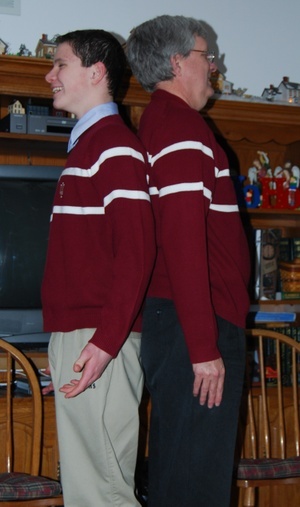 Guerin had a two hour delay this morning to deal with the snowy roads, snow covered driveway, and to clear off the parking lot, so Matt and I got to sleep in a bit and hang around the house this morning in our jammies marveling at the accumulated four inches of snow. Four inches of snow pretty much paralyzes the folks around here...in northeast Iowa this is a mere dusting and no one would dream of staying home or being on a two-hour delay. It looked really beautiful in the early morning quietness. Mark snowplowed the driveway and Alex trudged off to the bus stop as CHS did not have a two hour delay, being business as usual there, compliments of our tax dollars at work as the snowplows, etc. usually clear out the Carmel school lots and drives as a top priority on days like this. The true appreciation for all things cold and snowy, however, is most obvious today in the four legged critters of Tibetan origin...Pippin and Vash could not wait to get outside and frolic about in all this glorious white powder. It is fun watching them jumping, playing, and trying to eat the snow as it is floating down. Almost makes me want to go out and join them...almost...well, okay, maybe just for one second or possibly two. 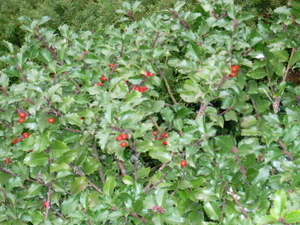 The holly bush beside the front door...the little red berries a sign that Fall is All Over Already. I know winter doesn't officially begin until December 21st, but everything else around here says that Autumn has left the building. The lovely leaves are no more, just brown gray sticks waving about in the cold air inspiring...well, not much of anything in my book. Last night the wind howled and howled and I never did get to sleep beyond about an hour...definitely not enough. I love the ocean, going to the ocean to visit, and seeing the immense possibilities of it...but I have to say, I could not live permanently by the ocean. It's just too noisy. The waves going about to and fro, the surf constantly pounding the shore...last night's wind reminded me that I grew up in the night silences of northeast Iowa and anything else just seems foreign and unsettling. Yes, the wind would howl in Iowa much like it did here last night, etc., but it stops after short bouts...the ocean's noise is relentless and does nothing to quiet my soul. The wind yesterday, last night, and continuing today makes me apprehensive and restless. It's one of those days I would love to think that if I click my heels together and repeat three times, "There's no place like San Diego..." that maybe somehow I might be magically transported like Dorothy to Kansas...alas, I am fairly certain it only works in movies with yellow brick roads and Munchkins. Where would you like to be transported today? 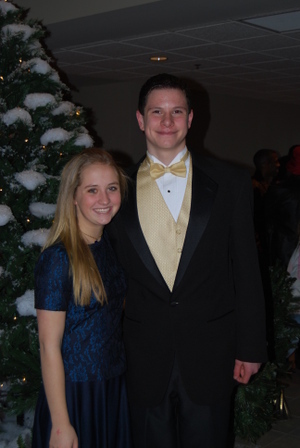 All Together Now...Happy Birthday to You, Happy Birthday to You, Happy 17th Birthday, Dear Kate, Happy Birthday to You! Seventeen looks great...especially on you! We love you! Hope your day is as special as you are! The Rosary Centurions last evening praying the rosary and making rosaries for the American servicemen (Matt saved one to send to Mike Kopacko serving in Afghanistan so that will be fun for Mike to get that in the mail soon). 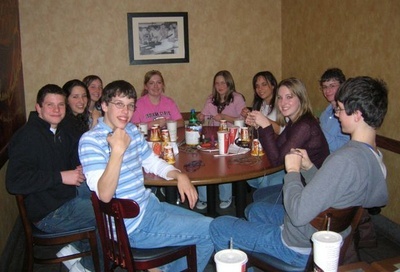 They met at Donatos as Donatos has a private room that they let the kids use while they gather, create, and eat pizza. The moms get to have a little Mom Time out in the outer room and eat dinner, chat, etc. A fun time was had by all!